Heterogeneous catalysts have been some of the most economically important nanostructures since well before “nanotechnology” became a buzzword, and they remain so today. 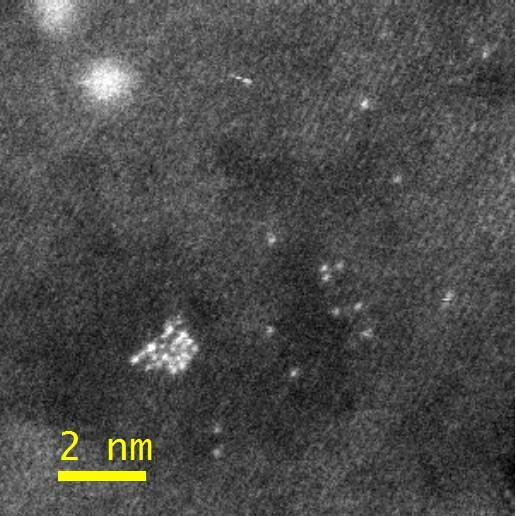 Advanced electron microscopy is one of the only ways to evaluate the crucial surface structure of the nanometer-diameter particles that are the most catalytically active. Using Z-contrast STEM, it is now straightforward to image even single atoms of high atomic number metals on low atomic number oxide or carbon supports. Z-contrast STEM image of Pt nanocatalyst on a g-alumina support. The small bright dots are single Pt atoms. We have studied several nanocatalyst systems, including Pt/?-alumina, which is a prototype for industrial catalysts used in hydrogenation / dehydrogenation reactions, Ru on mesoporous silica (SBA-15) for conversion of cellulose into feedstocks for biofuels, Au / carbon for oxidation of CO from aqueous solution of polyoxometalates. We used STEM to characterize the size, shape, and dispersion of the metal particles, and collaborate with catalysis researchers to understand the correlations between structure and catalytic activity or selectivity. The corner of a larger Pt nanocatalyst particle, with displacements of the corner atom labeled in picometers. 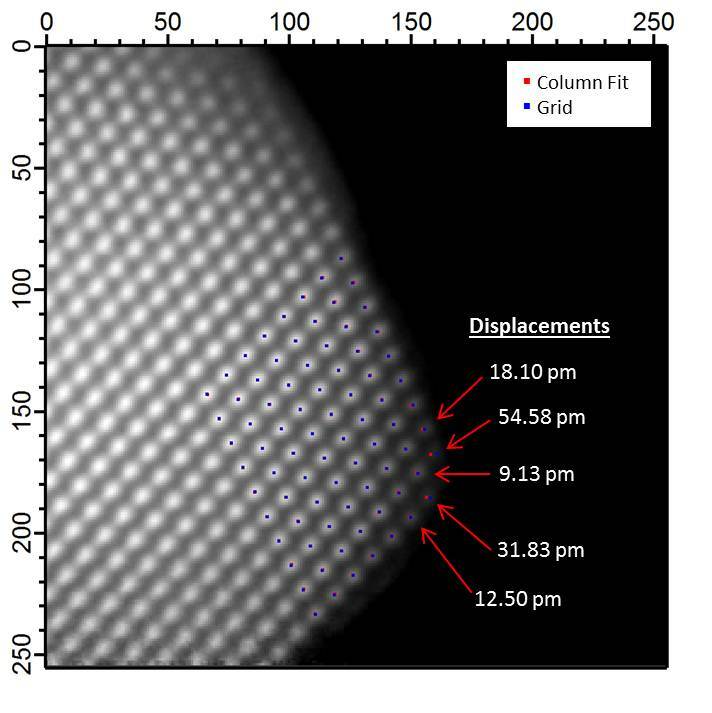 More recently, we have applied the high precision STEM techniques we have developed to measuring the off-lattice displacements (strains) of surface atoms in nanocatalysts. Of particular interest is measuring displacements at edges where two facets meet and at corners were two or more edges meet. The atoms in those positions are undercoordinated, even compared to normal surface atoms. The under-coordination shifts them from their lattice positions and changes their electronic structure. In some cases, simulations show that edge and corner atoms may be wildly more catalytically active than the rest of the particle, to the point that they play a significant role in the total catalytic activity despite their low density. Making these measurements is quite challenging because it requires limiting the electron dose to the sample – otherwise the surface atoms move, often leaving their lattice positions entirely. Developing strategies to deal with this problem in STEM imaging is an ongoing project. In the long term, coherent electron nanodiffraction like what we have used for fluctuation microscopy may be another useful approach. For available positions in this area, please check the openings page. “Bifunctional Materials for the Catalytic Conversion of Cellulose into Soluble Renewable Biorefinery Feedstocks”, Damian Reyes-Luyanda, Josseant Flores-Cruz, Pedro J. Morales-Pérez, Luis G. Encarnación-Gómez, Fengyuan Shi, Paul M. Voyles, and Nelson Cardona-Martínez, Topics in Catalysis 55, 148 (2012).